Maybe I should've read the fine print. They told me no payments for a year. I figured I would accrue interest and that was okay. What I didn't get was the credit limit. My carpet was $3500 with no payments. When my first bill arrived I had $700 dollars of interest charged. That was okay. But, my credit limit was only $3500 and now my account is $700 over limit. And, you guessed it. A $39 fee for being over limit, every month until I got caught up. I was very upset. It took me a very long time to get it under my limit. And of course they wouldn't agree to raise my credit limit. I felt completely duped and taken advantage of. 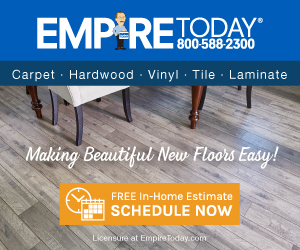 I will never buy from Empire carpet again, nor will I use GE financial services. Review #134861 is a subjective opinion of KAM. Same thing happened to me, and I DID read the fine print. My contract said 0% interest free for one year. Nowhere was it mentioned that the offer was conditional upon full payment being made within the year. Nor the penalty - as stated in the original thread. I am in NYC and THIS IS IN VIOLATION OF RULE 5-06 of NYC Dept of Consumer Affairs rules. I have filed a complaint with NYDCA and it is currently being acted upon.